Retro gaming fans will immediately notice the Atari 5200 prominently on display all over the place. The game store owner, Morris (played by none other than the talented William Forsythe in his chubbier and less attractive days), has references abound. You’ll see another 5200 on display as a demo, stacks of shiny silver 5200 carts everywhere, that awkward 5200 controller and how goofy we looked using it, ColecoVision consoles behind cages, and of course Morris himself programming a game in basic on a Commodore Vic-20. You can literally make a game of pointing everything out. Hardware junkies will even laugh at the dissection of a 5200 cart sequence, the A/B switcher when Morris goes from Vic-20 to 5200 on his TV, and just about any scene where a wired bomb exists. They even call the Atari games “tapes,” a common nickname for cartridge-based games that lasted into the NES era. 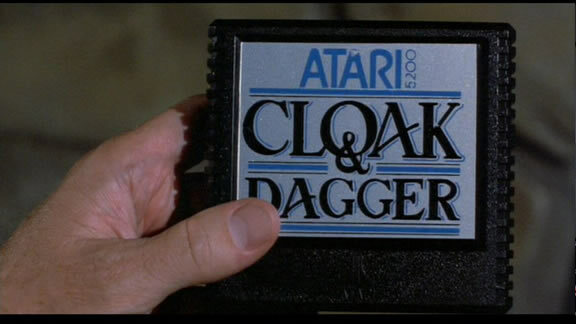 Heck, the secret plans in the Cloak & Dagger Atari cart are unlocked by achieving a ridiculously high score. 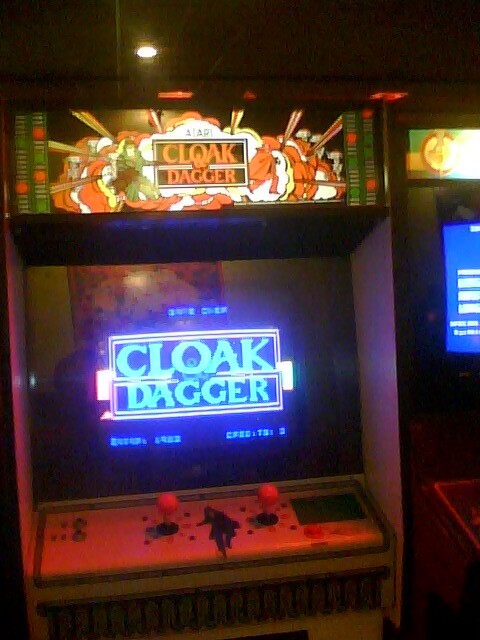 For those wondering, Cloak & Dagger did get released and it is the game in the movie, but what you see is actually the arcade game as the 5200 port was canceled due to the crash. At the time of filming, the 5200 port wasn’t even started yet, although the arcade game was in bars across America. It’s not just retro junkies that will be enchanted because my wife was noting staples from the 80s left and right. First off, almost everyone in the movie has a mustache and they are all as diverse as the cast. Some have thick Burt Reynolds mustaches, others have handlebar-like thin lip hair, and still others have that Miami Vice “cop ‘stache.” It’s fantastic. The duplex with diagonal wood paneling, the Ford Tempo Davey’s dad drives, the way a mall looked luxurious, and the amazing wallpaper found in everyone’s bedrooms. 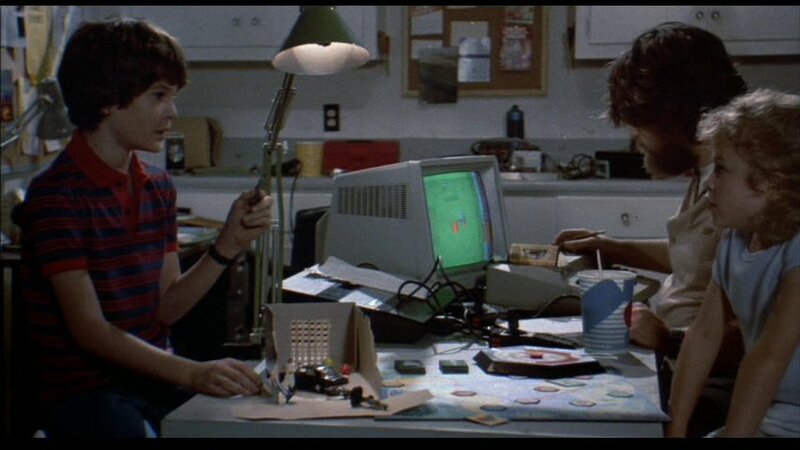 I was only 2 when this movie came out in 1984 and my wife hadn’t even been born yet, but that didn’t stop us from appreciating all of the throwbacks from tech to style that is firmly captured in this film. 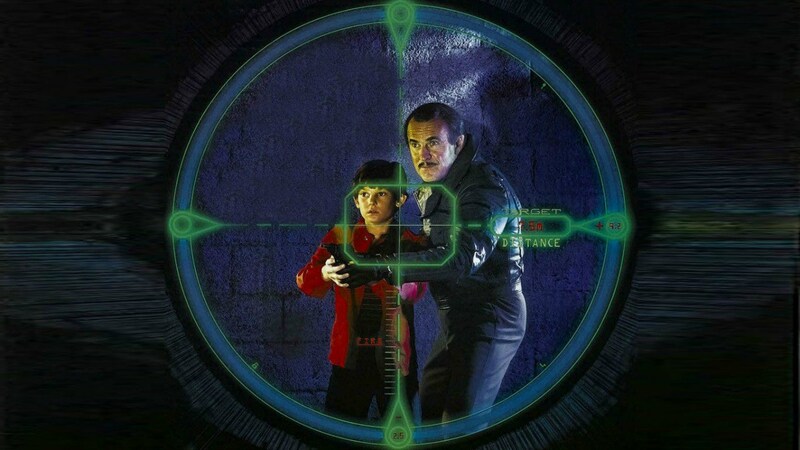 I’m guessing it was because a generic catalog was used for the art direction of this film, since the important items to a young boy is the action on screen and not the sheets on the bed. As long as it worked with the scene, it was probably thrown in and the box was checked. This serves a great purpose if only to show off what a Sears catalog for the time looked like, because it comes to life in Cloak & Dagger. Aside from the nostalgia, there’s also a great deal of absurdity. 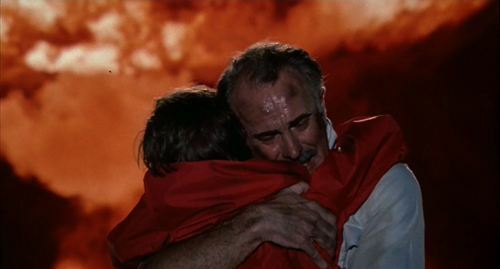 We all know “times were different” back then, but it’s no more clear than the events as they unfold in this film and how society responds to it. Lets start off by the fact that you have Davey and his younger friend Kim (she’s probably 8) traversing around the streets of San Antonio, Texas on summer break without any supervision. The duo have bus passes and basically navigate the entire city without so much as a passing glance from anyone. There’s even a scene later on where Davey’s dad (a widower) and Kim’s mom (divorced) have a discussion about how it’s after dark and they haven’t seen or talked to their kids all day. This is completely normal to them and what may surprise some younger or more conservative readers is the fact that this was completely normal for the time. By the time I was 10, my mother would get up and go to work during summer break and never see or hear from me until she got home that night. Even if I wasn’t in the house, she probably wouldn’t panic until after 8 pm. It’s great to see and reminisce. In addition, Davey is being pursued by three burly men in cheap suits and sweats the whole movie and no one seems to care or notice. There is a part where two guys are creepily following him, flashing guns and knives, and smiling at him as they try to get in his face on a boat tour. No one says a thing, not a thing. This kid could be gutted in a little San Antonio creek in front of 50 witnesses and no one bats an eye. That was totally possible back then, no sarcasm. In the mid 80s you just minded your business and accepted that sometimes kids were out and about like adults. There is an elder couple who takes notice of this whole phenomenon and even asks Davey what’s wrong. He points to the guy and says he’s being followed, which triggers the guy chasing him to smile creepily in his direction, and the old woman actually says, “he looks like a pervert!” It was great, made me laugh out loud. We weren’t oblivious to the world back then, we just minded our own business. There’s another scene where Kim has been kidnapped by these men and they threaten to throw her off a cliff at the gardens. Take this in: a large 6 foot tall muscular guy is holding a small 8-year-old blonde girl who is clearly struggling over a cliff…in public…in broad daylight! No one seems phased by this at all. No one says anything, no one questions it. That part, I find hard to believe. I feel that even back then someone would say something because that’s far beyond casual minding your own business and more like flagrantly ignoring an abduction or possible murder. The same goes for any scene involving a gun – and many do – with a silencer. You can apparently shoot pistols and even shotguns in business stairwells, mall back rooms, and even airports without most knowing or doing anything about it. Just fire quickly, throw the gun in your pocket, and the world is none the wiser. Then again, it was in Texas. 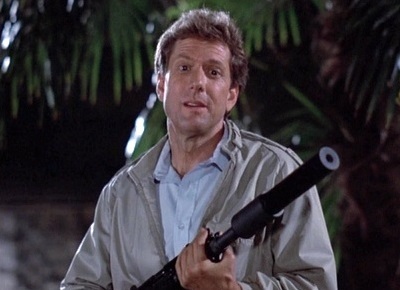 Davey also carries a water pistol that looks just like a real hand gun, no red tip or anything, which was also common for the time. Finally I have to commend the movie on basically being a tourism guide for San Antonio in the 80s. On this two day romp Davey visits a ton of notable locations in the San Antonio area that look like places I would like to visit. You will get to see the legendary Alamo where the “twist” of the film comes in. While being chased by hired goons Davey will visit the Riverwalk, Japanese Sunken Gardens, and of course the aforementioned river boat tour. Davey and Kim visit a large building that contains a fake Texas electronics company, which is probably due to the fact that Texas Instruments (or TI) was in Dallas and nowhere near San Antonio. The mall, while many misconceive as being the Windsor Park Mall, is actually the Glendale Galleria in Glendale, California (and you 90s kids may note that this mall also makes an appearance in Terminator 2: Judgement Day for the arcade scene). While some online seem to have good things to say about the Windsor Park Mall in the 80s, most people seem to write it off as being a dump and it doesn’t appear to exist today. While it may sound like it, I have never been to San Antonio, but I now feel I know a bit about its landmarks and surrounding suburb Alamo Heights thanks to this movie.